Here are some sneak peaks at the dining room progress. We have the ceilings, trim and walls all painted. Yeah!!! I love the color of the walls. It is called Stone White and is just a hint of light gray to the walls. This was the wall color before we painted. the ceilings were the same color as the walls so we needed to paint the ceilings white. Painted all the trim and crown molding to a white and then the walls in the stone white which is a light gray. Got some new gray and white checked fabric from Ikea for the chair seats. This is also the fabric for the new curtain panels. I almost forgot to take a picture of this old vintage china cabinet we inherited from Terry's grandmother before painting it. I took the door off and the drawer and shelves out and started to paint before I realized I did not have a before pic! Sorry so this is what you get to see for a before shot. A little drama with this piece. With it being so old furniture makers use a lacquer finish that was yellow oil base and it keeps bleeding through as the white paint dries. I did two coats of Kilz primer and now two more coats of white and it still is slightly on the cream side. So I am going to try one more coat of a bright white and see if that will work. Libby my photo bomber assistant! 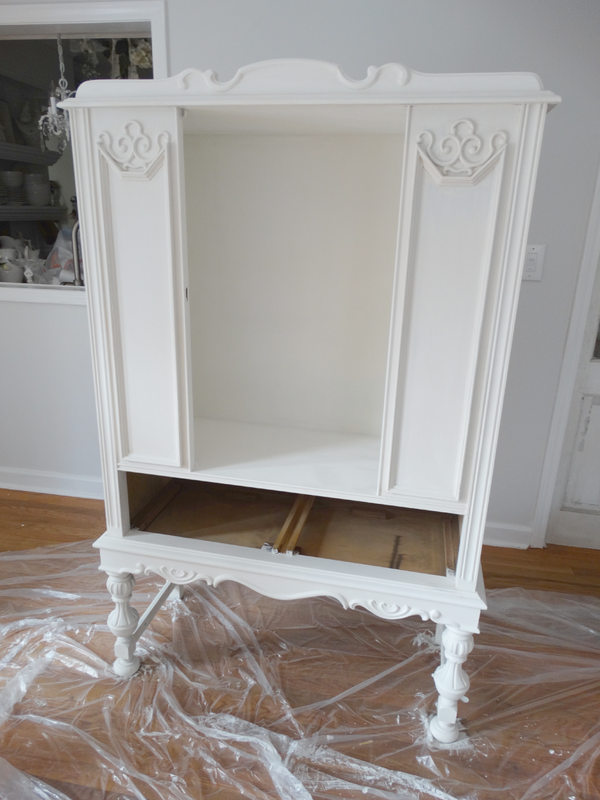 So hopefully after painting a few pieces and getting this cabinet to look less cream in color I will begin to start thinking about what to bring back into the room for decor. I am going for a light nordic cottage look to blend with my kitchen. Just sooooo tired of having stuff everywhere and my poor wood floors are a mess. So it will be nice to get things hung and put up and then clean my floors and hopefully be done and ready to show you the reveal. Plus Terry and I would like to have a few day trips for some fun while he is on vacation this week. So hopefully I will get this room together in the next few days. As we head on down to the New Year I want to wish all of you a very Happy New Year. I look forward to sharing lots of inspiration with all of you in the new year. The room looks great so far! I can't wait to see what it looks loke when you are finished! Have a Happy New Year! I have found that shellac will cover almost anything and not allow bleed through. I use Zinsser Bullseye Clear Shellac. I love the wall color. So sorry about the china cabinet. What a pain! Have fun on your day trips. Your new wall color is so pretty and peaceful and calming, Kris! The room is looking great! 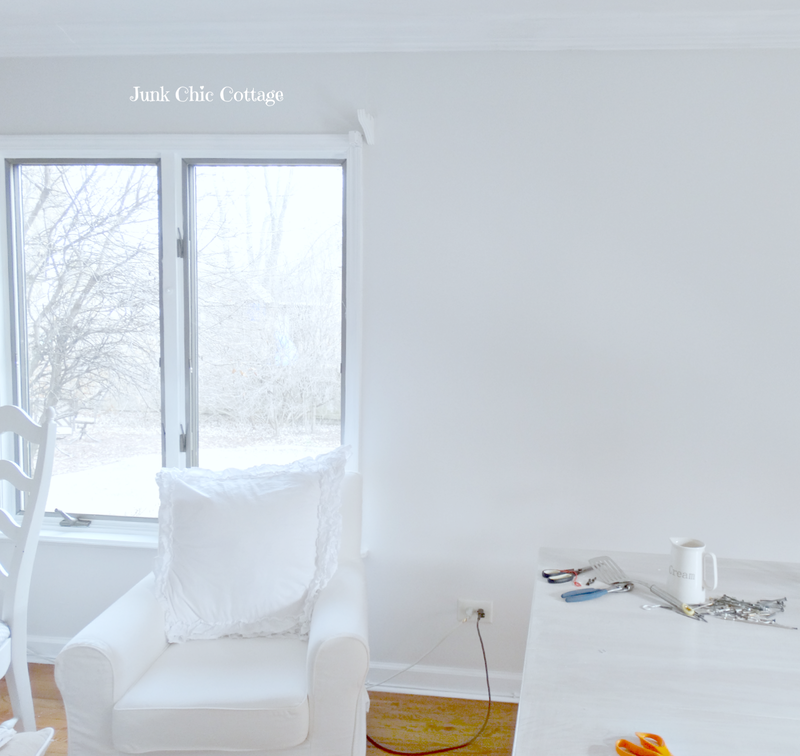 I hope to get my family room and master bedroom painted in a shade of bright white this winter. 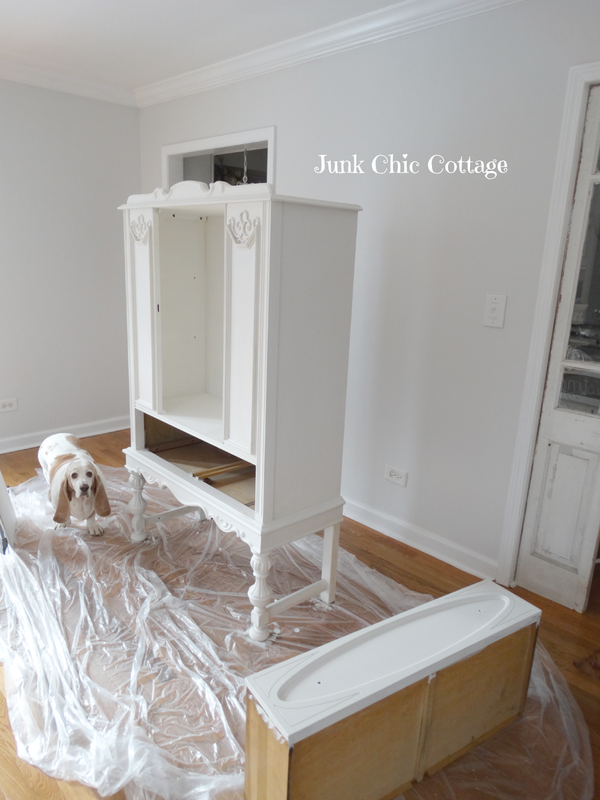 I love the look of white furniture, but I hate painting it. Hope you get to make your day trips while Terry is off. HAPPY NEW YEAR!! Love the new color, so pretty. Can't wait to see more. Oh Kris the new color works beautifully, calm, serene, reflective. Take a break, relax and enjoy in all the beauty you and Terry create. Love your room so far. Can't wait for the finished reveal. This year I am going more white and having a declutter. Looking forward to changing things for the better. Love the new paint color, and that great gray check. Have fun this week, can't wait to see how you put it all together! Love the new paint color! I have been looking for a light gray neutral color for our master bedroom. You mentioned the name (Stone White) but I didn't see the brand? It is Glidden called Stone White. This is the first time I have used Glidden and it was really great paint. I am a big fan of Behr but loved this color so I gave Glidden a shot and it was nice paint too. Good luck with painting your master bedroom. It will be a great serene color for a bedroom. The new colour of the wall is so pretty and the furniture in white is just gorgeous. The colors look very nice. I admire your work and ambition! It will look great, I'm sure! Love that cabinet, Kris! I hope the next coat of white will stop the bleed through. Love that fabric on the chairs and I'm looking forward to seeing the window treatments, too. Can't wait to see the finished room! The room looks bigger Kris! It's going to be beautiful!! Can't wait to see it! Happy New Year!!!! It's going to be so beautiful!!! I love the hint of colour on the walls. mmmm mmmm! I'm loving it! Can't wait to see the finished project. I really like the new wall color and the fabric you chose, Kris. 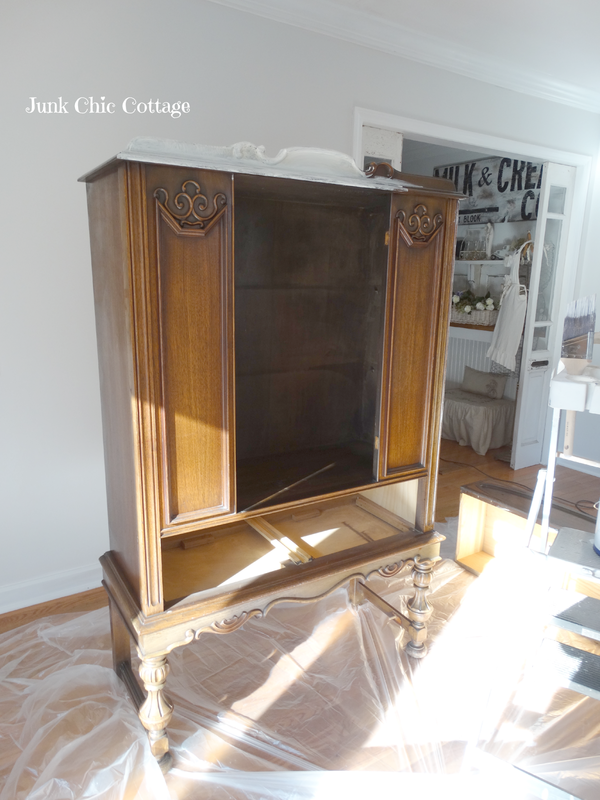 And what a pretty piece of furniture you've inherited and updated with white paint! I can't wait to see the reveal! Love the new wall color. Can't wait to see the finished product! Wow, and I thought I did things quickly! Amazing new color and I love the gingham. That is one stubborn piece of furniture. I hope you only need one more coat. Looking good and Happy New Year!! It's looking so good already! That cabinet is gorgeous, it will look beautiful done up Nordic style, can't wait to see it all done. Love the new paint color. Can't wait to see everything when you are done. Wishing you a Happy New Year! I love the idea of the Nordic look. 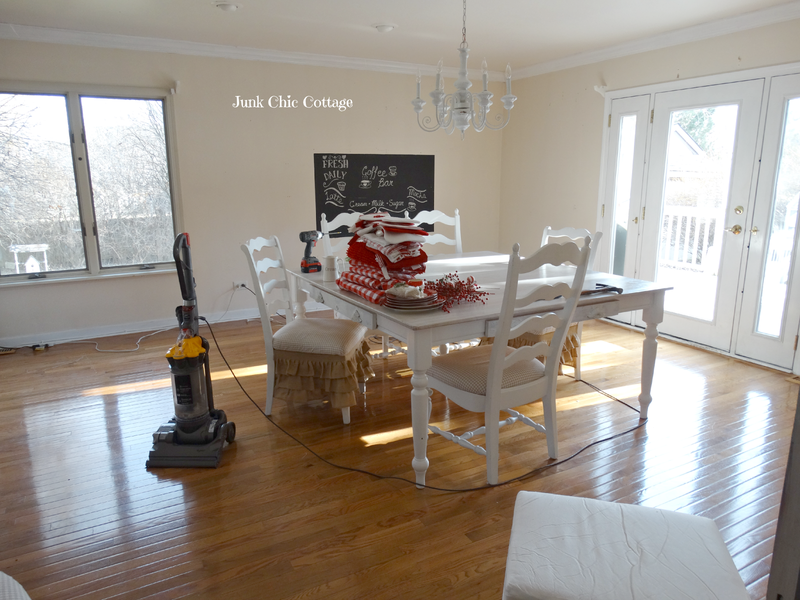 I always love your decor, but I have always thought it must be a lot of work to keep things dust free and clean. I hope you and Terry get away! Everything looks wonderful, Kris, and I think you and Terry are making fast progress. I know it's hard to have a room all over the place like this but it will all be a distant memory soon. I love the wall color and you are doing a fantastic job with that beautiful cabinet! Get those day trips in, snow HAS to be around the corner! The room was beautiful before, but am loving the new direction you are going with it now. I find the Nordic style so very calming and peaceful, and your white furniture is going to look wonderful against the new wall color. Looking forward to the final reveal. WOW that looks amazing! So fresh and bright. Can't wait to see it all complete Kris. Happy, Healthy New year to you all. The transformation is amazing, already. I'm not a grey girl, but the shade you chose won my heart. It's light and captures the light beautifully. Happy New Year! Kris! I love the Nordic look and I can see this is just going to be a beautiful room! I am looking forward to seeing it finished. Sending your warm New Year wishes! Wow, looks great already. 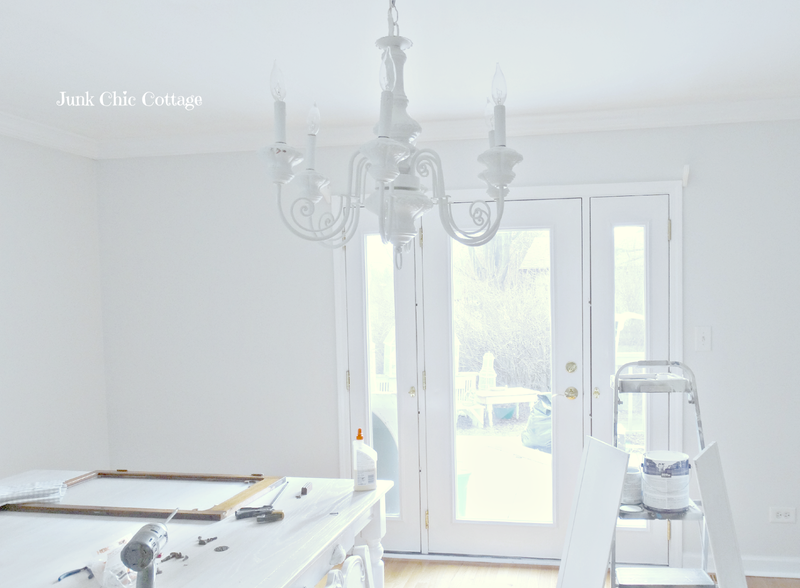 I love the vintage china cabinet and it looks so pretty in white, all the details pop. Can't wait to see this room put together Kris! This is getting exciting. Liking it so far. Love the new china cabinet. Looking for one similar for a TV cabinet. Happy New Year. Don't forget to take some time off for R & R.
The wall color is lovely! I cant' wait to see the finished room! Love the piece you painted also. If you ever want to give your red check curtains a new home, please let me know. Haha! I could only find the smaller size tablecloths at my Steinmart. Oh it's looking so good! 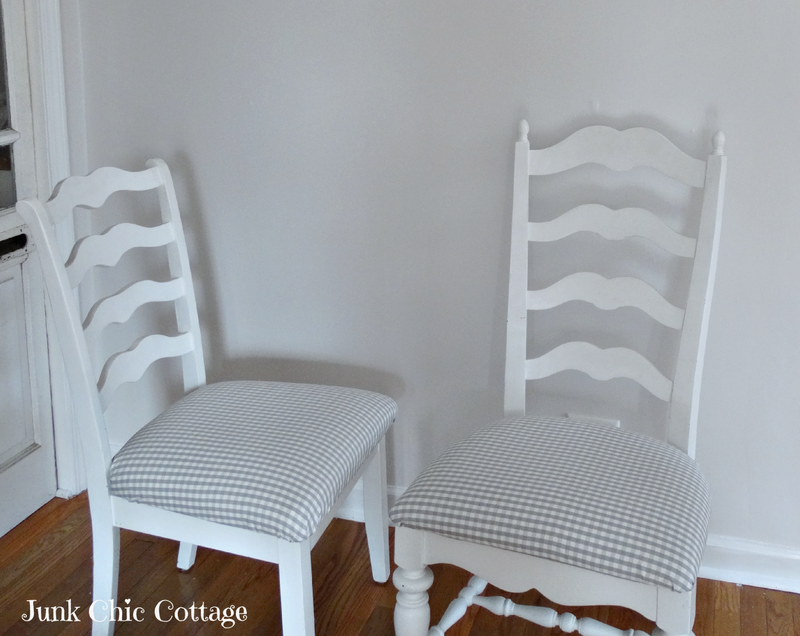 I love the new wall color and the grey and white fabric on your chairs. I'm looking forward to seeing the room when it's done. WOW, you and Terry are quite a couple. You guys really get things done. I am liking everything so far and can hardly wait to see you final reveal. Libby wanted to see what was going on - such a cutie. You and Terry have fun on your day trips and enjoy your mini vacation days. I love the new colour, Kris. And I can tell already that I'm going to love this room! You are one ambitious soul my friend! Love the new color and that cabinet is GORGEOUS! Can't wait for the reveal!! Hope you get some trippin time! Can't wait to see the final reveal of this room. Love your choice of fabric for the chairs! Oh Kris, it's looking so good!!! 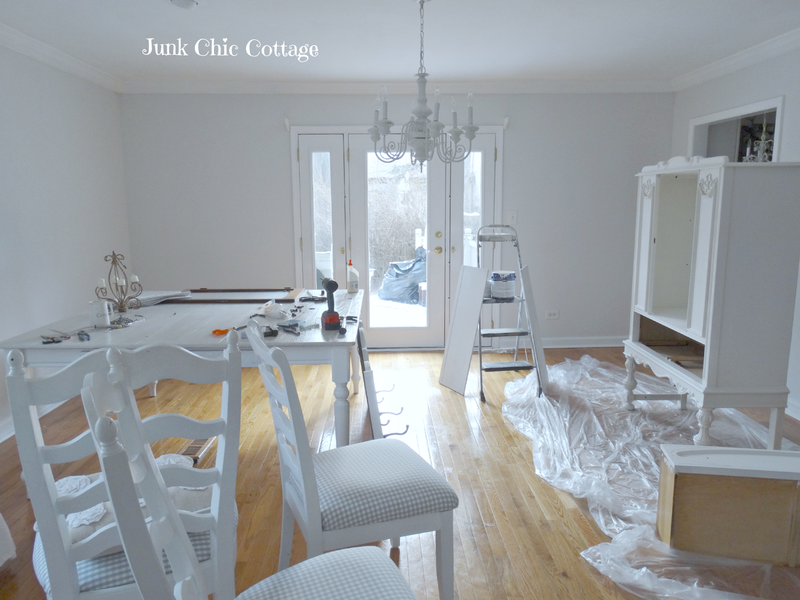 I love the new color and that vintage china cabinet is going to look fabulous when it's done! I also forget to take "before" pics all the time. I get so excited about starting a project that I forget all about it. :) You picked a beautiful gray and white checked fabric too. Love that! Oh, and Libby is so adorable, as always! Love seeing her pics! This is going to be so pretty, Kris...the room has so much wonderful natural light. I love your color choices and the cabinet is going to be beautiful!